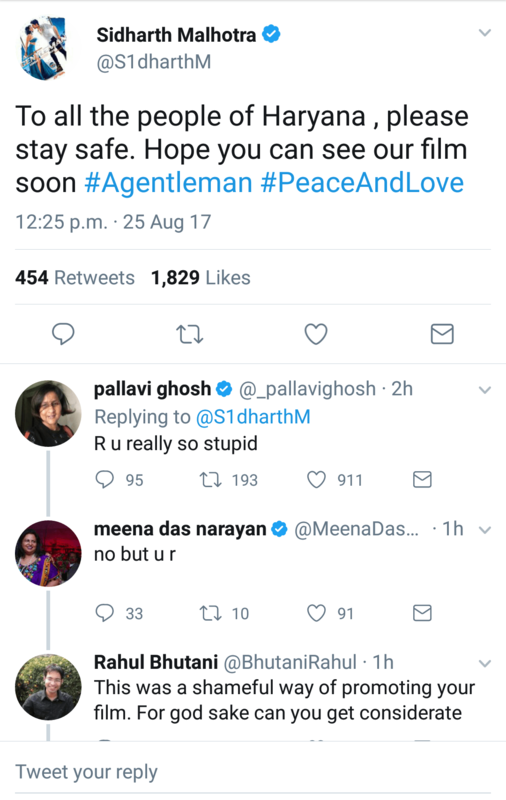 Sitting all the way away in peaceful Mumbai, Sidharth Malhotra wants people of Haryana to stay safe and watch his film A Gentleman. While we have seen enough instances of bizzare promotional strategy being adopted by Bollywood actors to promote their films, this one is clearly an example of the most insensitive one ever. At a time when the state of Haryana is on the boil since the past 24 hours, Sidharth decided to appeal for peace and safety by plugging in his film. Isn’t actor aware that mobile services have been suspended indefintely in Haryana. Does he think people will want to watch his film in such a situation. And how exactly does he want people of Haryana to watch his film when even stepping out of his house is impossible. What was the need for such a marketing gimmick. This as a viewer at Gaiety said is not Gentlemanly but mentalmanly. So not cool Sidharth. The actor tried to rectify his mistake after angry reactions poured in by saying he had posted the tweet before the judgment came in. Not many are ready to buy that.